Whew… we were a little behind the timeline we committed to on our product roadmap, but support for transactional emails is now live!. You can now add and manage your transactional emails, in addition to marketing (bulk) and automation campaigns (aka drip or email sequences) in BigMailer, included in all plans at no additional cost. Using SendGrid for your transactional emails now? Here is a SendGrid vs. BigMailer comparison. 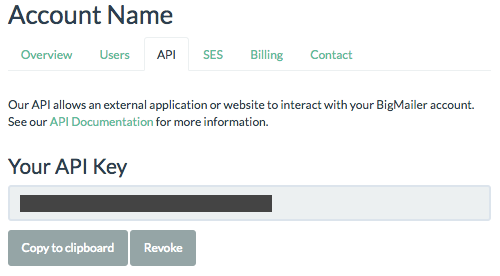 Use BigMailer for standalone transactional emails triggered within your application and store/manage your transactional email templates on BigMailer platform – this allows marketers to tweak CTA and content of those emails without getting developers involved. Use your defined transactional emails as triggers in automated/drip sequences. Automatically feed your transactional email contacts into appropriate lists for use in your marketing/bulk campaign. This is a benefit of managing your transactional and marketing/bulk emails on the same platform. EXAMPLE USE. Say you have an email collection form on your blog or site to get users to subscribe to your newsletter that goes into a list named “Newsletter Signup”. Once you setup a transactional email contacts to go into your “Regi” list or possibly “Paid Customers” you can segment your marketing campaigns based on those lists. Click on your username in site header (top right cornet), then select “Account” in the dropdown. Define all the fields for a campaign, save. Refer to API documentation to add email triggers to your application. We will be expanding our APIs and documentation in the coming weeks and months, but if there is some feature you are looking for please don’t hesitate to reach out.